In the early 1990s, Prague was reborn as a place that welcomes millions of travelers from all over the world every year. As the tourists stream in, others flourish. Among them, the pickpockets, thieves and "businessmen". Pickpocketing is one of Prague's most common crimes. We are sad every time we hear stories about someone getting their money, documents, camera or cell phone stolen. 1) Don't underestimate Prague pickpockets. Many of them are skilled "professionals". 2) Don't be paranoid. Make sure you are still enjoying yourself on your trip. 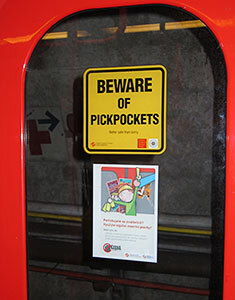 Although pickpocketing has been a problem in Prague, just like it is a problem in many tourist destinations around the world, thieves are not waiting for you at every corner. We have been robbed in other European cities, but never in Prague - knock on wood. • Don't carry large amounts of cash with you. Carry a credit card and take money out of an ATM as you go. ATMs are plentiful in Prague and their screens usually come with an English language version. • Leave important documents in a safe deposit box at your hotel. You should carry your passport with you, but leave a copy of it at your hotel in case the original gets lost. Making copies of your important documents is always a good idea when traveling. • Be careful on crowded trams and subways, especially in the historical center of Prague. Know what's happening around you and try not to find yourself squeezed in a crowd of other passengers. • Wear a money belt instead of a handbag. Although it can be a bit of a nuisance, we have found it to be a very secure place to keep our valuables when traveling. In addition, not having to worry about a handbag or wallet will free up your mind to fully appreciate the beauty of Prague. • If you are carrying a handbag, always be aware of it. Keep it closed up and hold on to it in busy areas. • Don't take out your wallet or money in busy areas. • Don't change money on the street. There are plenty of banks to choose from. • Be especially careful in very touristy areas: on Karlova and Melantrichova Streets, on the Charles Bridge, on Old Town Square, on tram 22, and in busy stores. Car break-ins are another common type of property crime in Prague. The advice here is simple: never leave valuables in your car. Car theft has also been a problem in the Czech Republic although the situation has gotten better in recent years. To prevent your car from being stolen or broken into, try to park in a parking garage instead of leaving your car on the street. 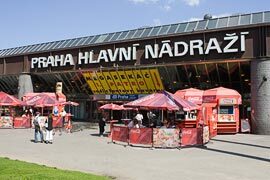 A list of Prague public garages and guraded parking lots is available on our Parking in Prague page. Aside from property crime, Prague is a relatively safe city. The rate of violent crime is low and most areas of Prague are safe to walk around even after dark. Be careful on Wenceslas Square. It is usually packed with tourists and the crowds make things easy for pickpockets. There have also been cases of trusting "love-seekers" being robbed of all their money at night. The city of Prague carried out a large cleanup operation on Wenceslas Square in 2006, which helped the situation some, but you still need to watch your bags and pockets as you stroll along. The park around the main train station (referred to by the locals as "Sherwood") is not the safest place after dark. The major renovation of the train station has resulted in much improved security inside the station, but you should still be careful in the park immediately outside the station after dark, or avoid it altogether.